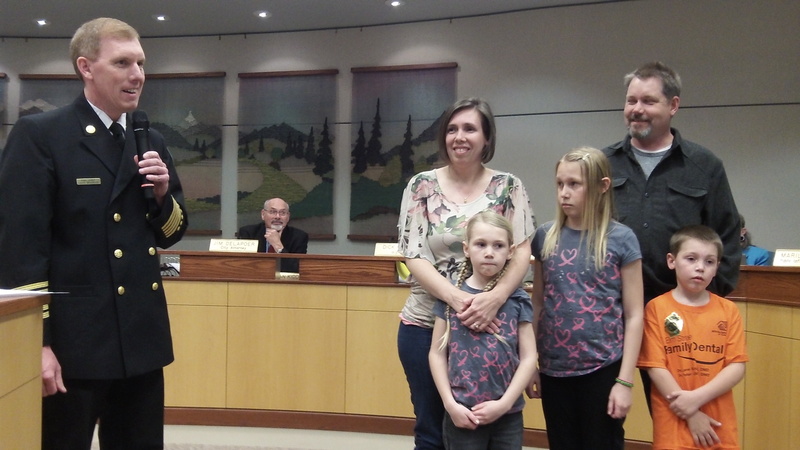 Fire Chief John Bradner with Mark and Andrea Ylen and their children, Maija, 10; Anika, 8, and Jakob, 5. I’ve known Mark and Andrea Ylen for years, starting when we all worked for the Albany Democrat-Herald, where Mark today is the photo editor. So I was delighted when Andrea and Mark, with their three children in tow, were called to the front of the council chambers at City Hall Wednesday night to be recognized and honored for something they did on Dec. 9, 2013. Fire Chief John Bradner presented them with a certificate and recounted the circumstances that brought it about. That afternoon in December, the Ylens were driving on Grand Prairie Road when they noticed smoke coming from a house. Mark parked their truck and called 911 while Andrea ran over to the house and pounded on the door. A young man came out holding his infant daughter, and Mark made sure no one else was in the house before the fire trucks arrived.